The NETGEAR Fast Ethernet Unmanaged Switches series are purposely designed, well built and rigorously tested for small and medium-sized networks where reliability and performance are the keys while Plug-N-Play connectivity and operational cost savings are the must-haves. With a 1U form factor, they can be placed on the desktop or rack-mounted with the included rack-mount kit for professional installation. 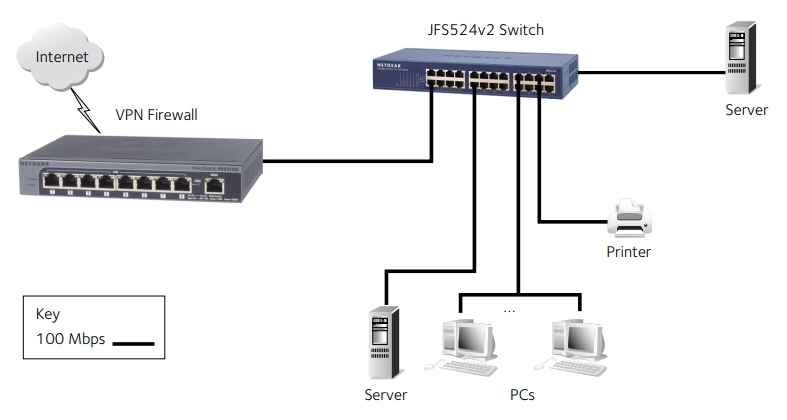 The JFS516 and JFS524 come with 16 and 24 ports 10/100Mbps copper ports respectively. They offer energy efficiency features and are compliant with the IEEE 802.3az standard. Both models are fanless for silent operation, business class rugged, and come with a lifetime warranty. *This product comes with a limited warranty that is valid only if purchased from a NETGEAR authorised reseller, and modifications to product may void the warranty; covers hardware, fans, and internal power supplies-not software or external power supplies; see http://www.netgear.com/about/warranty/ for details. 2-year warranty on power adapters on applicable models. Lifetime technical support includes basic phone support for 90 days from purchase date and lifetime online chat support when purchased from a NETGEAR authorised reseller. **The NETGEAR OnCall 24x7 contract provides unlimited phone and email technical support for your networking product. For ProSAFE products purchased prior to 06/2014, also includes next business day hardware replacement. Download the NETGEAR JFS516v2 and JFS524v2 Datasheet (PDF).